My goal is to create a single Access Rule policy to enable two way communications between the Main office and Branch office. Open ISA Sever Management Console. In the right pane, right click on the Firewall Policy, select New and select Access Rule. Enter the name of the Access Rule in the Welcome window. Click Next. Select Allow in the Rule Action window. Click Next. 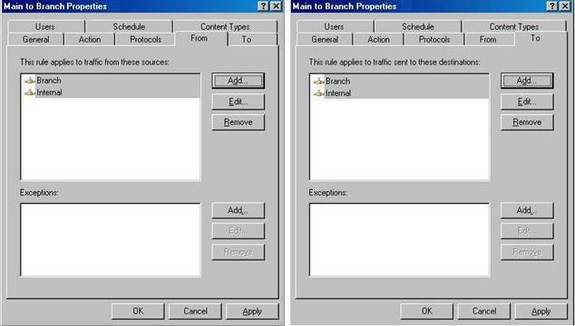 Select appropriate traffic in the Protocols window. Click Next. In the Access Rule Sources window, select the Internal and Branch networks. Click Next. In the Access Rule Destinations window, select the Internal and Branch networks. Click Next. Click Next in the User Sets window. Click Finish to complete the access rule creation. This Access rule will enable a two way wide open communication between Internal and Branch office networks without creating two separate one way rules. As always, I would like to hear your comments and suggestions after reading this article. If you have any questions, feel free to email me or post a comment on the newsgroup. Santhosh Sivarajan is an Infrastructure and Security Architect in Houston, Texas. His certifications include MCSE (W2K3/W2K/NT4), MCP+I, MCSA (W2K3/W2K/MSG), CCNA, and Network+. He has worked for large networking project companies for the past 10 years. His expertise includes Active Directory, Exchange, Migrations, Microsoft Security, ISA Server, etc.